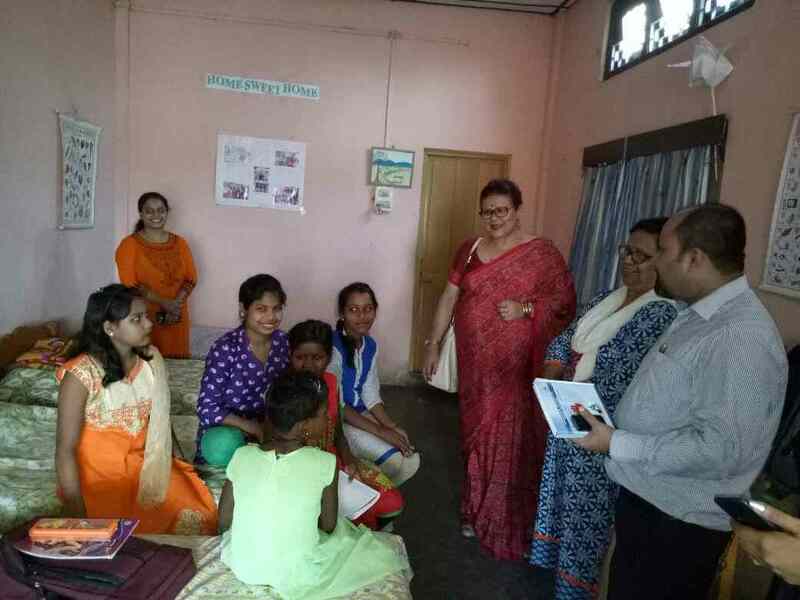 The former Chairperson Runumi Gogoi, along with team of the Commission visited the three districts of Barak Valley region namely Cachar, Karimganj and Hailakandi from 4-5 May 2017. The team included Dr. Tushar Rane, Chief of UNICEF, Field Office Assam, Shri. Gopal Ch Sharma, Member, Assam State Commission for Protection of Child Rights, Shri. Rajiv Kr. Jha, Technical Consultant, Assam State Commission for Protection of Child Rights and Miss. B G Pranami, Office Assistant, Assam State Commission for Protection of Child Rights. i. To conduct review meetings with the line departments to examine and review the status of implementation of the schemes and programmes pertaining to child protection and development. ii. To visit the Schools and the Child Care Institutions in the districts to examine and review the services and the implementation of the provisions as mentioned in appropriate Acts. iii. To visit the Abid Raja High School, Swadhin Bazar, Sonai to take a probe into the alleged possession of Spirits by the girl students. a. Visit to Jyoti kendra- Anganjur Durgabari Non-residential Special Education Centre. The team visited the Anganjur Durgabari Non-residential Special Education Centre also known as Jyoti Kendra. The center is an example to be followed by other such center and shown excellence in service providing by the stakeholders to train the children in getting enrolled into the formal education. The children in the children belong to the economically weaker section of the society and few children are reported to have been working to support the family and then they come to the center to attend to the classes. The students of the center showcased their excellence in performance. Mr. Gautam Das, the District Mission Coordinator informed that the SSA funds only for the Education Volunteer (EV) and the rent and other expenses of the center are met through various philanthropical contributions. The performances of the students were focused on the themes of Wash and Sanitation, Healthy Practices, Scientific processes such as Life Cycle, Water Cycle, Atmosphere, Child Rights, Abolition of practices such a Child Labour, Child Marriage etc. The students were also trained and had knowledge of the CHILDLINE services. b. Visit to Makbul Ali Mazumdar ME School, Anjurighat, Sonai. The team on its way stopped at the Makbul Ali Mazumdar ME School, Anjurighat, Sonai and paid a sudden visit. As the team entered the school, it was observed that a girl student named R Nessa Choudhury was being beaten by one teacher named Amin Uddin Laskar. It was observed that the number of students enrolled in the register of the register was more than 70 but however, number of students present, was 12. After inspection of the attendance register, it was revealed that most of the students do not come to school on regular basis. When enquired about the same, Mr. Supriyo Dhar, the Headmaster of the school informed that most of the students have shifted to another school. The team interacted with the students present and found that the Mid Day Meal in the school is irregular. No uniform has been provided since last two years. During the inspection of the school infrastructure, the cook namely Mira Begum Barbhuiya and Fatema begum Barbhuiya were found to be burning the text books of the school to lit fire in the kitchen for preparing the MDM. When enquired, they replied that they have been instructed by the Headmaster of the school to do so as they are not provided with Kerosene and sufficient fire wood. The team observed that a team from the health department was holding a camp for vaccination against Japanese Encephalitis and interacted with the officials present. It was informed that the response of community was very unsatisfactory to take the vaccination. Also, that due to the camp, very few students turned up to attend to class on that day due to the fear of being injected of the vaccination. It was also observed that the vaccination serum was nearing expiry date. c.	Visit to Observation Home at Meherpur, Silchar. The team visited the Observation Home at Meherpur, Silchar on 4th May 2017 at around 4 PM. It was observed that there was only one inmate in the home named Rubel Ahmed who is from Karimganj District. The team also interacted with the officials of the home. It was informed that the home receives at an average of maximum of 7 inmates. The infrastructure seems ok but, however, the security seems questionable. There are 4 home guards for the home on periodic duty basis. The Superintendent of the home informed that that the fund flow to the home from the SCPS is irregular and it costs difficulty in running the home and to provide quality services. It was also mentioned that the home has not received any funds since June 2016. He has visited SCPS on 16th of February 2017 and was assured that the funds would be cleared and released within 3 working days, but till date of the visit by the team no funds were released. The Commission assured to put up the issue with concerned for needful. d.	Visit to Children Home, Silchar. The team visited the Children Home in Silchar run by Wodwichee at Sonai Road at around 6 PM on 4th May 2017. The team interacted with the inmates of the home and inspected the documents maintained by the home. The children informed that they find the services by the home satisfactory. The team requested to the home authorities to collaborate with likeminded NGOs to avail educational facilities for the children those who would require special attention and services. The authorities of the home informed that the fund flow from the State bodies are irregular which creates difficulty in providing quality services to the children and also in maintaining the standard. It was also mentioned that in the Track Child Software, the name of the Home does not appear in the list which creates difficulty for them to upload and maintain the database. The matter was informed to SCPS but the issue has not been resolved yet. e.	Visit to Abid Raja High School, Swadin Bazar, Sonai Revenue Circle. It came to the notice of the Commission through various media news regarding an incident wherein girl students felt senseless in a school named, Abid Raja High School at Swadhin Bazar, Sonai, Cachar District where a LP school, a ME school, a Sub-Centre and a Anganwadi Centre exist in the same vicinity. It was mentioned in the news that few days back about 5-6 girl students felt senseless while the class was running. The same happened again after 2-3 days wherein the number increased. The news flashed that owing to the situation the school authority called in the “Mufti (a religious practitioner)” to tackle the situation, who responded that the girls are under the influence of spirits. The district administration, after learning the matter from the Headmaster of the school, send a medical team from the Silchar Medical College. The team undertook counseling of two students and wanted to counsel more students, but was stopped by the headmaster. The Headmaster also mentioned that such incident can only be controlled and dealt by the Mufti. The team after inspection submitted a report which mentioned that it was a case of mass hysteria. The team visited the school on 4th May 2017 at around 11 Am to probe the entire episode. The team was also accompanied by Miss. Twinkle Das, Protection Officer (Institutional Care) of the DCPU Cachar and Shri. Gautam Das, District Urban Coordinator, Cachar, SSA. The team visited the school and interacted with the students of class IX (B). 1. The school was established in the year 1973 and was provincialized few years back. There are 3 schools viz. LP School, ME School and High School, one Anganwadi Centre and one Sub-Centre which are located adjacent to each other within a radius of 200 meters. No boundary walls/fencing in any of the mentioned institutions to segregate one building from the other and thus putting the security of the children at risk. 2. The building of the Anganwadi Centre is in a dilapidated condition and when enquired, there were two statements contradicting each other were provided- (statement 1) That the Centre functions in the house of the Anganwadi Worker and (statement 2) That the Centre operates in the LP School but closes at 10:00 AM as the school runs from 10:00 AM. 3. The class rooms of the Abid Raja High School are very small and there were more number of students than the rooms can accommodate. The school was observed to have poor infrastructure and lack proper cleanliness. 4. When the team of the Commission entered the class room a stick was observed to be lying on the table of the teacher. As the team started the interaction, a girl fell unconscious. 5. The school authorities seemed to be reluctant to accept the seriousness of the incident and it was them, who invited the “Mufti” (religious practitioner) to deal with the situation rather than referring them to the health department for proper treatment. 6. While interacting with the students, the Commission observed that there was a stick kept in the class room and the student reported that the “Mufti” used to beat the spirit inside the girl student when she is possessed under the spirit. During the visit, the Commission found that the Mufti along with other such religious spiritual practitioner and media personal were present in the school. It is also observed that these practices followed are in variance with the norms mentioned in the RTE Act, 2009, JJ Act, 2015 and also a violation to the rights of the children. The Commission also found that anytime, when a team visits the school for investigation/inspection such incident of girls becoming unconscious and fainting occurs and the moment the team leaves the school, everything becomes normal. 1. The State Child Protection Society should ensure that the flow of funds is regular to the CWCs and the CCIs. 2. The DCPUs of the districts should visit the CCIs on a regular basis and sent their report to the SCPS along with the findings and request for needful. 3. The District administration should conduct regular meeting with all line departments and concerned stake holders to examine and review the status of child protection in their districts and take appropriate action as required. 4. The rationalization of teachers within the district is a must and thus, a list should be submitted to authority for rationalizing the sane from more teacher school to less teacher school. 1. The Commission strongly recommended that a Five - Six Member Committee including a retired Justice, representative from NCPCR, ASCPCR, Minority Commission, Department of Education, Department of Health be constituted to take a probe at the earliest. 2. The Boundary Walls/fencing of the institutions be immediately constructed to provide security to the students and prevent entry of unauthorized personals entering into the school premises. 3. Health Check-up and counseling sessions by the concerned Govt. departments to be conducted in the school. 4. This being a religious minority dominated area; an awareness programme must be conducted involving teachers of schools, Madrassas, religious and community leaders where a host of experts also including from the minority community provide necessary consultation to redress the situation in future. The rationalization of teachers within the district is a must and thus, a list should be submitted to authority for rationalizing the sane from more teacher school to less teacher school. 4. The rationalization of teachers within the district is a must and thus, a list should be submitted to authority for rationalizing the same from more teacher school to less teacher school.